Here's some info on food storage on the playa. a) Kept in the shade. Morning, Noon & Night. Make sure that wherever your cooler is located that there is something blocking any direct sunlight at all times. I've seen folks who have their cooler under a table or some such OVERHEAD sunblock, but fail to notice that in the morning the sun is still hitting the coolers directly for over an hour and a half. b) Open them ONLY when absolutely neccesary. This isn't your fridge at home, folks. Don't saunter up to it, open the lid, ponder whether you want the celery or the carrots, leisurely get what you need and let the lid flop closed. Make a surgical strike. Know what you want BEFORE opening the lid, Open it quickly, grab what you need, then close it tightly. I cannot emphasize enough how much difference keeping the thing sealed as tightly as you can will make. In '96 we had two coolers side by side. One was opened a lot, and the other was opened only twice a day for the first few days to check the ice. By the second day the first cooler needed more ice. The other one lasted almost 4 days. As others have pointed out, a great way of having your ice do double duty is to freeze water in plastic containers and use them as ice blocks. You avoid having your food swimming in water when the ice melts and you have Ice Cold drinking water for days. Another thing that you can use is Dry Ice. You can keep other food items or wet ice frozen using dry ice. For this you want as tightly sealed and as highly insulated a container as you can get. I have kept cups of ice cream frozen for four days on the playa stored in thick (2-1/2 inches) styrofoam coolers with a slab of dry ice on top of each. I have also kept bags of "wet" ice frozen solid for 3 days in this manner as well. 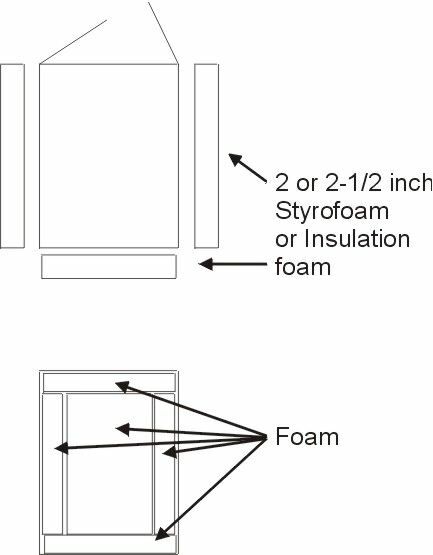 You can make your own styrofoam (or other insulation) coolers by taking a sturdy cardboard box (Computer Monitor boxes are a good choice) line the box with a large plastic bag, then line the walls of the box (within the bag) with slabs of thick styrofoam or board insulation cut to size with a final piece for the top. Then place one more plastic bag inside the styrofoam to put your perishibles into. Fill your cooler with your items to be FROZEN (note, a healthy slab of dry ice will keep the contents of this cooler frozen solid for at LEAST 2 days if unopened) then the slab of Dry Ice (wrapped in newspaper) on top. Fit the top piece of styrofoam on, close the cardboard box's lid, then tape shut. Copyright © 1999 Pat Mackey. All rights reserved. Of course, this being Burning Man, there are alternatives to ice to keep your food cool. See, for example, The jet powered beer cooler, which can, of course, be used with other beverages and food items and makes lots more noise than melting ice.